...and Asheville North Carolina Real Estate, is here to help you jump right into your Asheville lifestyle! Creative energy, the arts, nature, progressive thinking – and a great climate! Asheville is a special place and may be the perfect home for you. …you’ve been watching life go by and feeling a little anxious about finally being able to live the lifestyle you really want. 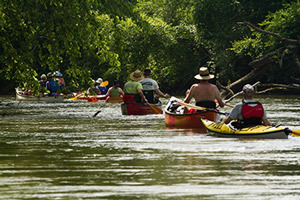 When was the last time you paddled down a river? And where is that box of art supplies or your folder of unfinished poems? Living in Asheville is fun and fulfilling! You have to be practical. There are lots of decisions – from what things to get rid of to which home will best meet your needs. Does it have to be so hard and horrible? No, it doesn’t! I'd love to help you plant your Asheville roots! Well, it’s now or never. Let’s get started finding your answers so you can get on with life and enjoy it to the fullest! You can contact me right now to get started or begin Step 1 of the Home Buying Guide. This Home Buying Guide will save you money, time and stress, and guide you to your Asheville dream home. Why move to Asheville - why move at all? Thinking through is the first step of your strategy for finding a home in Asheville. Consider your Asheville home place before you begin looking at houses. You need to choose the tree before building the nest! You need to be realistic in your plans to move to Asheville. Figuring out your home buying budget is the first step. Asheville communities include everything from downtown to hilly, rural-feeling homes on the edge. You'll want to find out which areas suit your lifestyle. Find an Asheville Realtor? But, you're looking for a house, not a Realtor - right? Wrong! The right Realtor is going to be very important. It's time to explore Asheville for yourself and to use the research you've done on the various areas. Get out your pens and pencils. It's time to start thinking about your Asheville dream home! Here's a great way to learn about the Asheville Real Estate Market! It's fun and easy. Visiting homes in Asheville is the next step in your journey to moving here! If you've done your home-work well, it's time to choose an Asheville home! There's at least some Asheville information here that you're going to need! Here's a great short Asheville video called <b>The Spirit of Asheville.</b> It really does convey Asheville's spirit and is fun to watch. Do you think you'd like to rent in Asheville before you buy? Here are some thoughts and places to look. There are lots of people working at creating community in Asheville. If you've clicked on this link, you may know what I'm talking about. Learn the basics from Asheville Maps and you're on your way to figuring out how to get around! You'll need to find Asheville NC lodging at some point in your search for home. Asheville Retirement Resources is a list of helpful links to help as you consider retiring here or for use after you've retired here. Let this be your one-stop place to look for Asheville resources when considering a move here. This is my favorite page! I'm passionate about green living and enthusiastic about helping you to Go Green! Asheville green homes are popping up all over - healthier, more energy efficient and a good investment! Asheville green building makes this a great place to live if going green interests you. The common Asheville green building certification processes are important for you to understand if you have any interest in buying a home with green features. A green home checklist will be helpful to you as you consider homes to buy, even if they aren't built green. Asheville green Realtors have special training and networks that will help you in purchasing a healthy and sound home, even if it isn't certified green. Real estate definitions will will help you navigate the real estate culture, which comes complete with its own language. This list of Asheville green building definitions will help you understand more about green building. Asheville Forums is a great way we can help each other <em>plant Asheville roots.</em> This is the place to share your stories, photos, tips and favorites! I'd love to see your special Asheville Photos! We all would. Please tell us about a special picture you took and post your photos here! I hope you'll contact me so I can help you plant your roots in Asheville! You should probably know a little about me if you want to take my Asheville real estate advice seriously and consider working with me or someone I recommend. Green Tree Realty is my asheville real estate business. I'm not a franchise. I'm "local" - so if you believe in buying local, you'll want to want to work with me! If you find the information on this site useful, please consider helping with a $10 donation. To say "Thank You" for your generosity, while supplies last, I will send you a copy of my 27-page book The Official Asheville Home Hunter's Handbook. It's a workbook based on the strategy I outline here. I think you'll find it useful, even if you don't move to Asheville.